A spicy, south-of-the-border twist on an Italian specialty, highlighting the green chile pepper, juicy jumbo shrimp, gooey frying cheese, & creamy avocado. Raise your hand if you love Mexican food! Have you ever tried to blend the two together? That’s exactly what I tried to do with this Mexican Caprese with Cilantro Chile Shrimp, and while it may not have come out like I imagined, I’m giving myself points for creativity! I have been eating and adoring tacos for forever. When I was a kid, our closest Taco Bell was two towns away, and every so often, I’d convince Nana to drive over so I could get my usual – three soft tacos supreme. A few years later, a local gas station opened an in-store mini Taco Bell, and I was in taco heaven every time Nana needed gas. When I got older, and more comfortable in the kitchen, I finally learned how to make my own; even though I ate them solo, I always made enough ground beef for two nights’ worth. One thing that was constant back then was my love for Old El Paso. 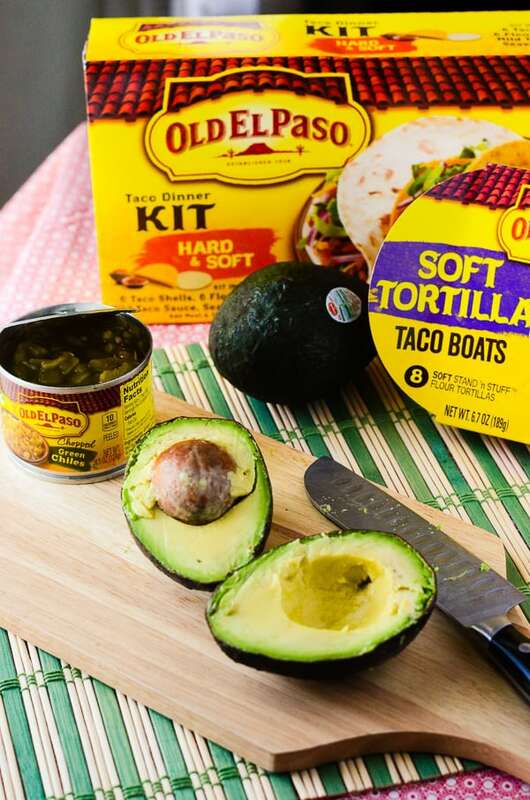 Their kits made taco night so easy – they include everything you need to make your homemade tacos shine. 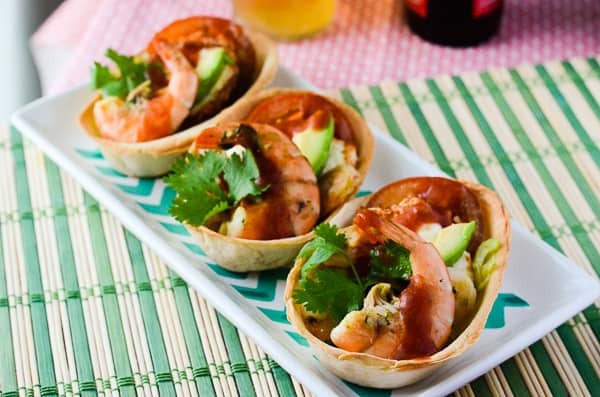 My favorite product from their line are their taco boats, and even though I’m a soft taco girl at heart, I love to crisp them up a bit and make them into handheld, self-contained taco salad shells. I was not such a fan of avocado as a kid (I’m sure that’s terribly shocking) – it took Mr. Crumby coming into my life for me to discover how delicious the versatile fruit can be. He also introduced me to queso frito – Dominican fried cheese. Ooohhhhhh my goodness, folks. If you take nothing away from this recipe, at least try the fried cheese. It is absolutely to die for, and I’m guilty of nibbling on it while cooking to the point that I’m not even hungry for dinner. This Mexican Caprese, though…it’s a perfect dish for any summer fiesta you might be throwing, be it a large shindig or taco night for one. Right now, thanks to Publix, you can save some money on any Old El Paso products you might want to scoop up! Mexican avocados are super ripe and in season now, too, and it’s the best time to swing by and pick up one or two or ten and indulge in some healthy, tasty guac. Since we’re all in a part-tay kind of mood, I wanna help you fiesta this summer! Sometimes, those crazy experiments end up in fun, flavorful dishes like this one! Combine chiles, garlic, lime juice, cilantro, spices, and salt in a large bowl with both kinds of shrimp. Toss to coat, and refrigerate for at least 30 minutes to marinate. Preheat oven to 350 degrees F. Set taco boats on a baking sheet and bake for 10 minutes until they begin to crisp. Remove from oven and set aside. In a large saute pan set over medium heat, saute large shrimp and 2 Tablespoons of reserved marinade for 3-4 minutes until they turn pink, then add medium shrimp and remaining marinade. Cover and simmer for an additional 5 minutes or so, until shrimp is cooked through. Remove from heat but keep covered. 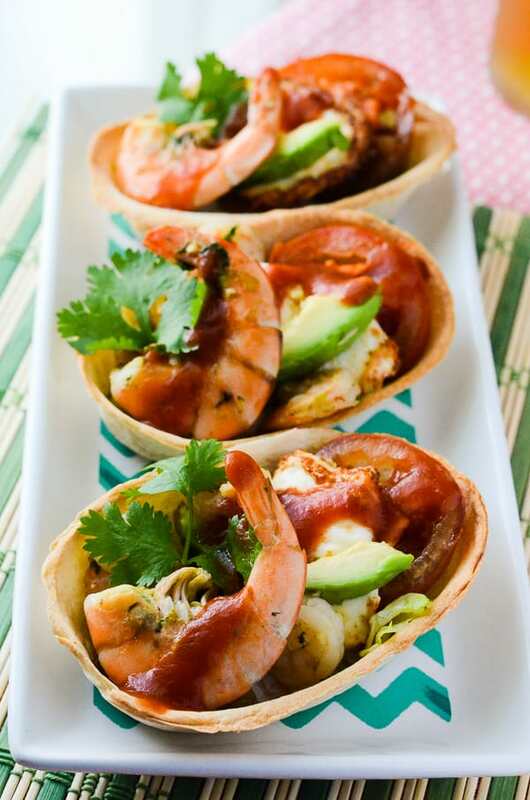 Portion shredded lettuce and medium shrimp into each taco boat. Prep tomatoes and avocado slices, and have them ready to layer. In a medium saute pan, heat olive oil over medium heat. Add 2-3 slices of queso at a time, frying each side until it’s golden brown, about 2-3 minutes total. (Don’t add too many slices at once – it will spread the heat too much, and your slices will need to fry longer and absorb the oil flavor.) Remove with a slotted spoon to a paper towel to dry. 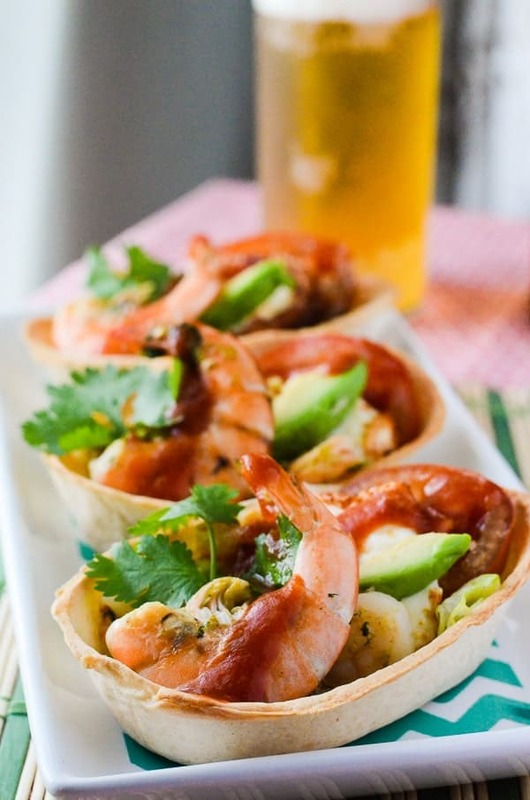 After your cheese slices cool a bit (no more than a couple minutes), layer your caprese on top of the lettuce and shrimp – tomato slice, queso, avocado slice, then jumbo shrimp. Drizzle with taco sauce (and more lime juice if you’d like), garnish with a spring of cilantro, serve and enjoy! I like it in guacamole or on a sandwich with turkey and bacon. I love to smother avocado on my chicken and veggie wrap for lunch. I love to eating avocado and turkey bacon sandwiches! I’m raising my hand! love me some Mexican food. And shrimp! These little dishes look delightful! Thanks for sharing!! I like Avocado Egg Salad . Oh my gosh! 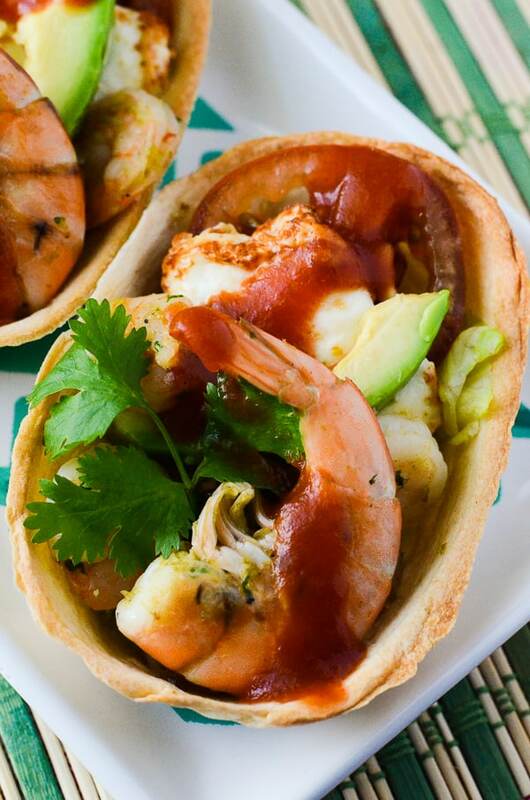 I love those taco boats! I’m totally going to search them out. I love how easy this is, and even more, how great tasting it looks! My favorite way to eat an avocado is by making my homemade guacamole and putting it on top of my Nachos! Every way you can eat avocado is my favorite! Seriously, I can just eat it with a spoon! They’re a staple in our house!